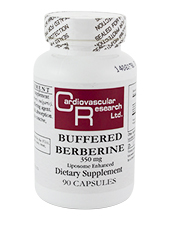 Product Description: This scientifically designed supplement contains Barberry Extract (Berberis vulgaris). Calcium carbonate acts as a buffering agent. Warnings: If pregnant, nursing or trying to conceive do not use. Suggested Use: Titrate gradually, starting with one capsule daily with meals for the first week, up to a maximum of three capsule daily, or as directed by a physician.